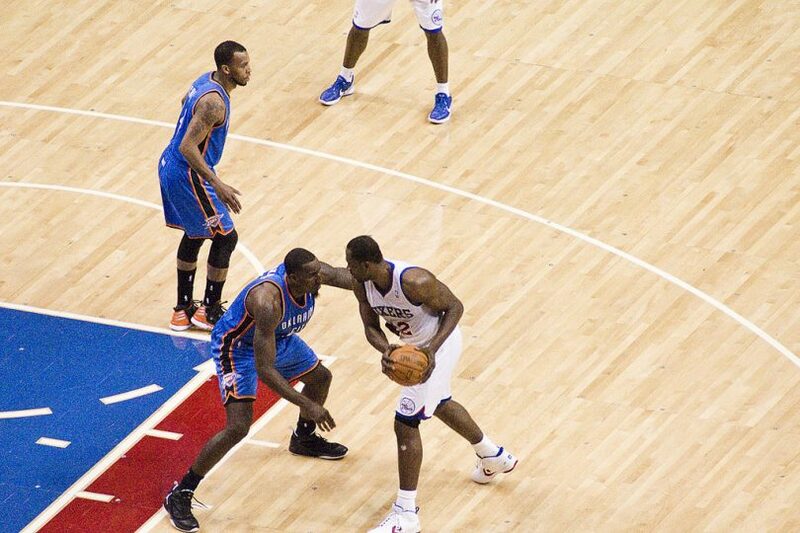 Image: “76ers – Thunder Game Feb 29, 2012” by Tim Scott is licensed under CC BY-NC-ND 2.0. Alright, basketball and Sixers fans, we finally made it through the trade deadline of the 2018-19 NBA season. We all witnessed this past week’s mayhem that was the LeBron James and Anthony Davis fiasco — wondering whether or not the Lakers would blow everything up in their young core and ship it off to New Orleans. What we didn’t expect was for Elton Brand to pull one of the best trades of this year, and that’s even after he traded for Jimmy Butler back in November of last year. All, if not most, should have heard of the trade made by the Sixers at 2:17 a.m. Wednesday morning. This news was reported by ESPN’s Adrian Wojnarowski, which sent a snubbed All-Star in Tobias Harris, Boban Marjanovic and Mike Scott of the Los Angeles Clippers to Philadelphia for up and coming rookie Landry Shamet, Wilson Chandler, “The Moose” Mike Muscala, a 2020 first round pick, Miami’s 2021 Unprotected first round pick and a 2021 and 2023 second round pick. Like many of you, I was shocked when I first saw the “Woj Bomb” drop on the NBA world. Not only was that trade big, but it was also significant for bench depth, and overall time for specific players such as Joel Embiid. As the trade deadline continued to swirl around the NBA world until the clock struck zero on Thursday afternoon, additional trades were made that only bolstered the 76ers depth even more. One that shocked the Sixers’ fan base to its core was the trade of former first round pick Markelle Fultz to the Orlando Magic for veteran Jonathan Simmons, which only adds to the depth of the bench, and saw many mixed fan reactions. Then, there was the final depth trade for James Ennis of the Houston Rockets, which did not see any player leave, only having the teams swapping rights for a 2021 draft pick. As the Sixers got depth and finally reached their best possible point of “The Process,” the other top teams in the East got some more stardom to add to their own squads. The current top team in the East, the Milwaukee Bucks also saw some changes to their roster, with ESPN’s Adrian Wojnarowski reporting that center Thon Maker was traded to the Detroit Pistons for Stanley Johnson, an unknown to most, but he didn’t last long. Hours later, Johnson and Jason Smith were sent to the New Orleans Pelicans for a star player in Nikola Mirotic, already making a top team in the Eastern Conference an even bigger threat for the many teams in the NBA trying to dethrone the Golden State Warriors. Besides the Bucks, the other top team in the East, the Toronto Raptors, also made some moves Thursday reported by Wojnarowski, sending Jonas Valanciunas, Delon Wright, CJ Miles and a 2024 second round pick for known Memphis Grizzlies star Marc Gasol. Unlike the other three top teams in the Eastern Conference, the Boston Celtics sat pretty and kept their lineup the same, perhaps waiting to strike at the New Orleans Pelicans star Anthony Davis come the summer offseason. Looking back upon this year’s trades, it is clear that the Eastern Conference won. The West was quiet, sending most players to the East, while the reigning champions in Golden State were also quiet on the market. From what we have seen this year, I think that we can all say that for the first time in a couple years, that this year’s Eastern Conference playoffs will rival this year’s NBA Finals.